Parking available on Illinois street as well as a private lot across the street. Only a 5 minute walk from Grand Red Line stop! Let us Cater your next event!! We Deliver!! Contact our Catering Office Monday-Friday from 10am-5pm. After office hours, feel free to contact the restaurant directly to place any Catering Orders. *Please note, some items may require 24 hours advance notice to prepare. 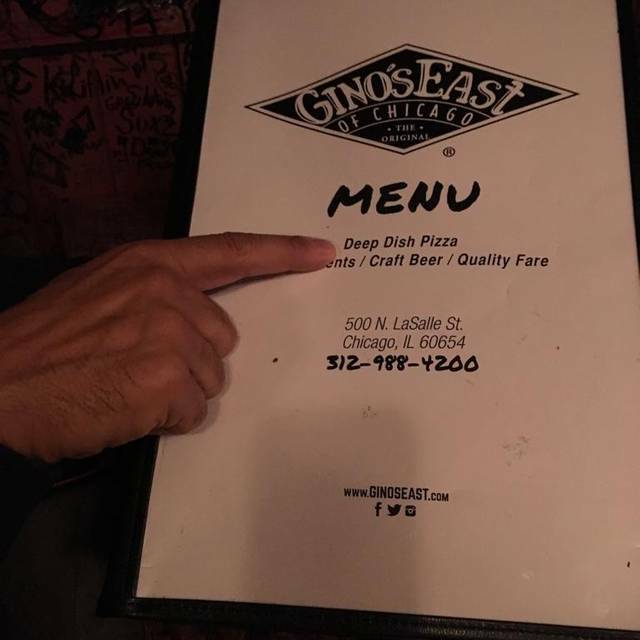 Gino's East River North; come grab a beer from our own Gino's East Brew Pub, enjoy comedy shows seven days a week at The Comedy Bar upstairs, or come in for our classic Deep Dish pizza. Where else down town can you get the trifecta of deep dish pizza, craft beer, and comedy? Rotating Handle, 5 Rabbit Cervecería, Chicago, Illinois 10 oz. Gose, Off Color Brewing, Chicago, Illinois, 4.3%, 12 oz. Flanders Red Ale, Brouwerij Rodenbach, Roeselare, Belgium, 6.0%, 11.2 oz. Belgian Pale Ale, De Brabandere, Belgium, 7.3%, 12 oz. Fruit Lambic, Brouweij Lindemans, Belgium, 2.5%, 12 oz. Flanders Red Ale, Brouwerij Verhaeghe, Belgium, 6.8%, 12 oz. Flanders Red Ale, Noon Whistle Brewing, Illinois, 5.0%, 12 oz. Saison/Farmhouse Ale, BFM (Brasserie des Franches-Montagnes), Switzerland, 5.0%, 12 oz. Witbier, Avery Brewing Company, Colorado, 5.6%, 12 oz. Saison/Farmhouse Ale, Whiner Beer Company, Illinois, 6.6%, 12 oz. Saison/Farmhouse Ale, Great Divide Brewing Company, Colorado, 7.3%, 12 oz. Saison/Farmhouse Ale, Brasserie St. Feuillien, Belgium, 6.5%, 12 oz. Pilsner, Lakefront Brewery, Milwaukee, Wisconsin, 5.75%, 12 oz. Pear Cider, California Cider Company, Sebastopol, California, 5.0%, 12 oz. Seasonal, Vander Mill Ciders, Spring Lake, Michigan, 16 oz. Non-Alcohol, Einbecker Brauhaus AG, Einbeck, Germany, 0.5%, 11.2 oz. I hadn’t been in years. And I’d never been to this location. I remember it being way better before. Pizza was cold. Service was slow and they forgot to bring my drink. The waiter was nowhere to be found after he took our order so I wasn’t able to flag him down to remind him. My God daughter came to visit and wanted Chicago style "deep dish" pizza. There's only two places I would have taken her to get deep dish pizza and Gino's East is one of them. I love their crust! The flavor is just right and the texture is perfect. We had lots of toppings so the pizza was absolutely delicious! 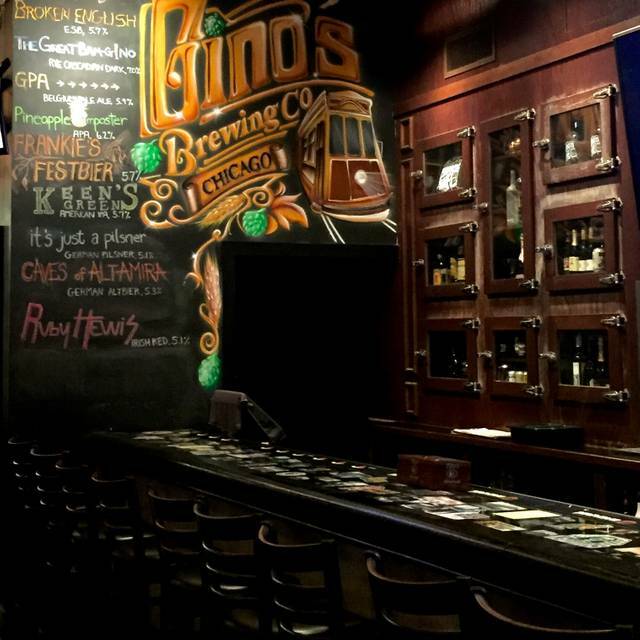 If you have visitors and they want Chicago pizza, then take them to Gino's East. Out waiter was wonderful and the atmosphere was really pleasant (we were there on a Wednesday at 1:00pm). Thanks for the great memory with my God daughter! Amazing pizza and great beers! Can’t recommend the Brussels sprouts but they were kindly comped without us asking! Friends from Arizona came to town for the Blackhawks game. They love Gino’s pizza! Very friendly staff,food was good value and tasty. Service was awful. Appetizer was lukewarm. Had to ask several times for refills. Had to get up and ask for a fork, because waiter kept forgetting. Food was good though. I grew up eating at Gino's East old location. I have the taste of that crust burned in my memory. the current pie's are a disgrace. 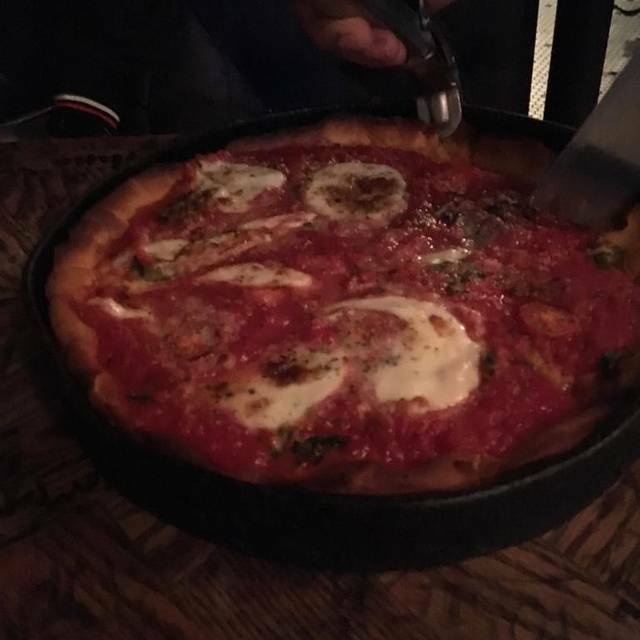 It’s my new favorite deep dish in town! And their beer was good! The witte chicks dig me tasted like a witbier. Very drinkable. Sauce was sweet and so good. I just wasn’t a fan of the crust ... almost like dried up cornbread...expected a better crust. Everthing else was ok. I was Certainly disappointed vs the hype and that takes a lot. Did not care for the pizza, was not representative of typical Chicago pizza. Was too greasy and flimsy. We had a large party of 14 people. The food all came out at the same time and it was perfect temperature. They service was really great especially with a big party. My only complaint was that it was too warm in the room we were in. I didn't realize when I made our reservation that this location is also a comedy club. Luckily, we arrived early (and were able to be seated), so we were finishing our meal just as the show was beginning. The pizza was great, and the beer options were plentiful and varied. Exactly what I was hoping for! I hosted 24 guests at Gino's East. All the staff went out of their way to make us feel welcome. The pizza and other food items were delicious and expertly prepared. Thank you for an outstanding dining experience. 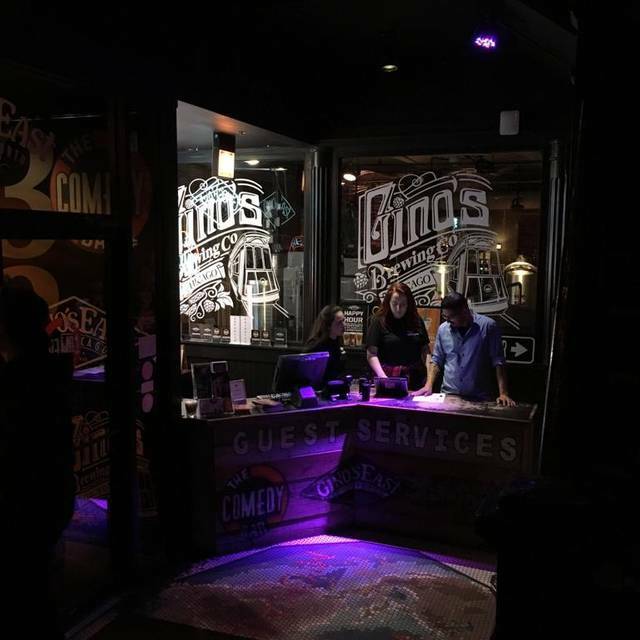 It was evident the entire Gino’s team was committed to a positive dining experience. 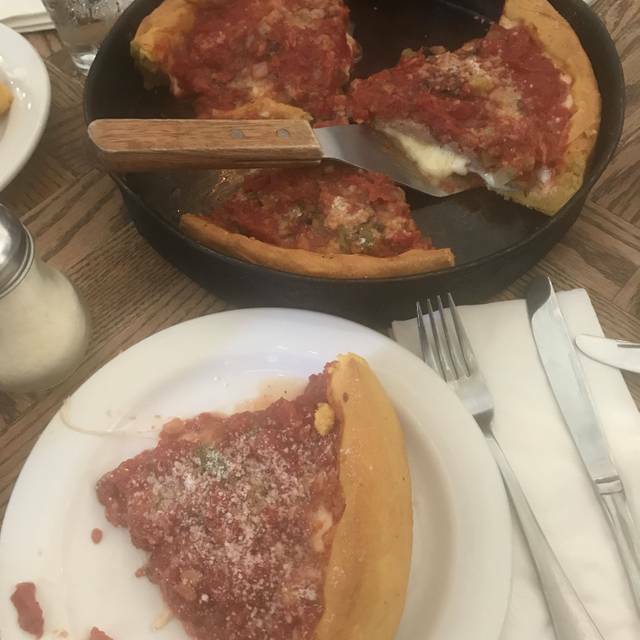 The food and service were equally good, and we enjoyed our first Chicago deep dish experience! Chicago establishment. Solid food and great service. Celebrating my wife’s birthday in Chicago. Had to get some Gino’s #deepAF. Awesome pizza. Salad was good too. Different atmosphere then the original Gino’s east but very nice. The food was great. I'm from New York and have had deep dish pizza a few times in the past, but never liked it. Gino's East is definitely the place to go. 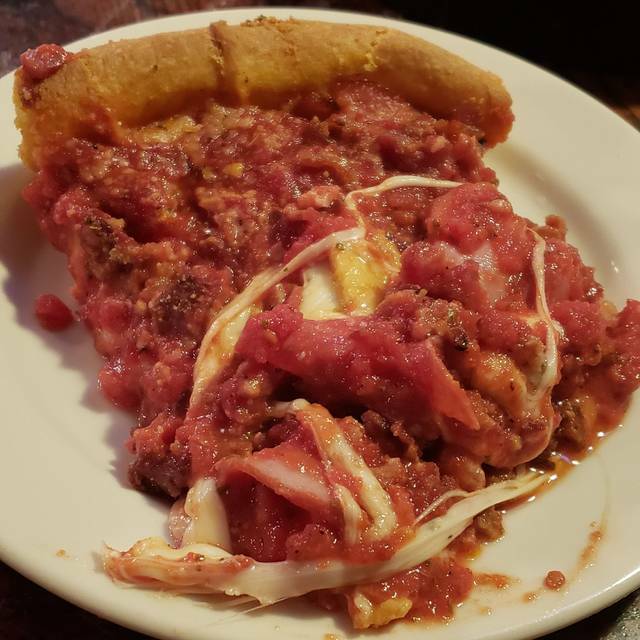 My fiancee and I went there and ordered the deep dish - meat lovers. It was delicious! What more can I ask for! The Ginos Brewery beers were not that impressive - but lets be honest, you don’t go to Ginos East for beer. I’ve recommended Gino’s for years and was excited to be in town and go to the river north location. I was truly disappointed - we had to go to the bar to get napkins because we couldn’t flag down a waiter even though half the place was empty. After waiting they brought us our appetizer with no silverware or napkins. They then brought us the wrong pizza so we had to wait for them to redo it. When the wrong pizza arrived they still did not bring us silverware or napkins. They charged us for one pizza (right one) left us with the wrong one and had no bag to carry it in around town/to go. Hugely disappointing birthday trip. Won’t go back. Pizza was mediocre. Good pizza. Bad management and understaffed service. If you want carry out this is the place. If you want food service, keep walking. Not servers fault, just way understaffed with management nowhere to be seen. The wait can be long if you dont have a reservation, but its worth it. Phenominal pizza, and that i can have it shipped halfway across the country to my house is the best thing ever. 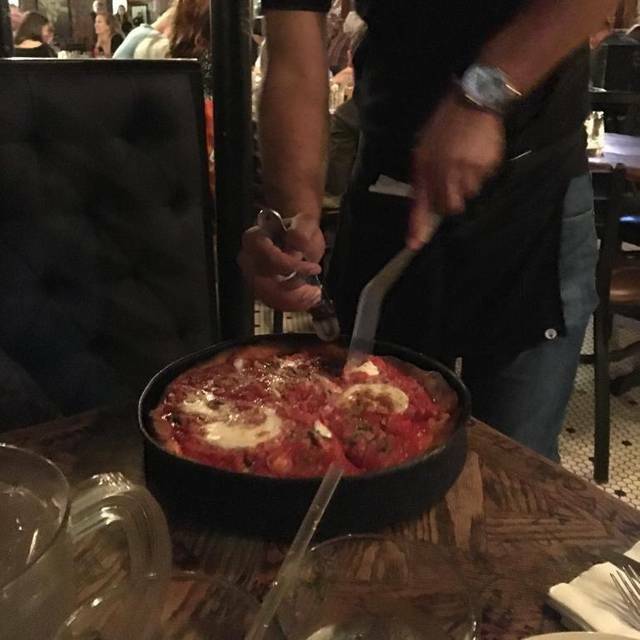 Gino's East is a place I frequently bring visitors to who want to experience Chicago deep dish pizza. The food is on par (or better) than some of the other Chicago pizzerias, but the added brewery makes it even better. I've never had an issue getting a table here or making a reservation (this can be a challenge at other places). Will definitely be back. The pizza was so amazing! A hint for the next time: try and order the pizza ahead of time since it takes a while to make. 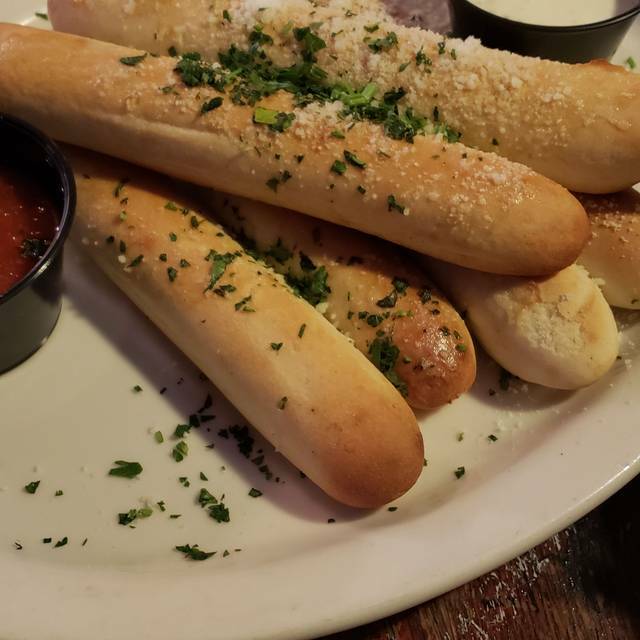 Or you can order one of their great appetizers! My wife and I dined here with some friends. We were sat promptly even though we arrived five minutes early. The waiter, Paolo, was super courteous. We ordered Calamari, a Deep AF pizza, and Wings. The drinks were good, the wings were awesome, the pizza and calamari were not. The wings were cooked to a perfect temp and the sauce was on point. The Calamari was over-cooked and rubbery (though I should have expected this now reflecting that I was at a pizza joint). The pizza was undercooked and luke-warm. The cheese wasn't even stringy when pieces were cut out of the pan. My wife was very disappointed as this was her first authentic Chicago Deep Dish. I told our server that the pizza wasn't very good and he apologized. We were not visited by a manager or anyone to determine why we didn't like it and I did not want to make an evening out with friends awkward. We ended up going to a competitor the next day and had a great experience. We are loyal Gino’s customers and were disappointed in our last few visits. Things were great just the way they were & not sure why the business feels the need to fix what isn’t broken. In our last visit the pizza was luke warm, found they no longer offer thin options for lighter eaters like kids, and switched to Pepsi products just to name a few. It seems as franchises increase quality and consistency are going down. It’s no longer a highly anticipated yummy meal as quality and consistency of offerings is up for grabs. Disappointing to say the least. I was nervous after reading other reviews but we had a great experience. The waitress and the guy who brought our food were both very nice. Our pizza was great and the harvest salad was delicious. Everything was fine except out pizza was served Lukewarm. Not the way you want to enjoy pan pizza especially when bringing an out of town guest who has never had Chicago pizza. We were in Chicago for the weekend with family that had never been to the city. Gino's East has a great vibe with all of the writing on the tables and the walls, phenomenal pizza, extra crispy mozzarella sticks and great cocktails and beer!! Had been quite a few years since I'd eaten here. Brought two friends to Chicago for their first visit and wanted to treat them to "Chicago deep dish" pizza. Our pizza was luke warm and the crust was tough to eat and not at all like the nice crust usually on a deep dish pizza. The salad and beverages were fine. We ate at the LaSalle location. The 2 deep dish pies we had came to the table quick but the cheese was not melted and the sauce not hot while the crust was charred. We understand they changed their cooking time by speeding up delivery from 45 minutes from the order to 30 minutes. Ours came out faster but the quality suffered. Seems it was cooked faster at a higher temperature. Suggest they go back to the original cooking process . 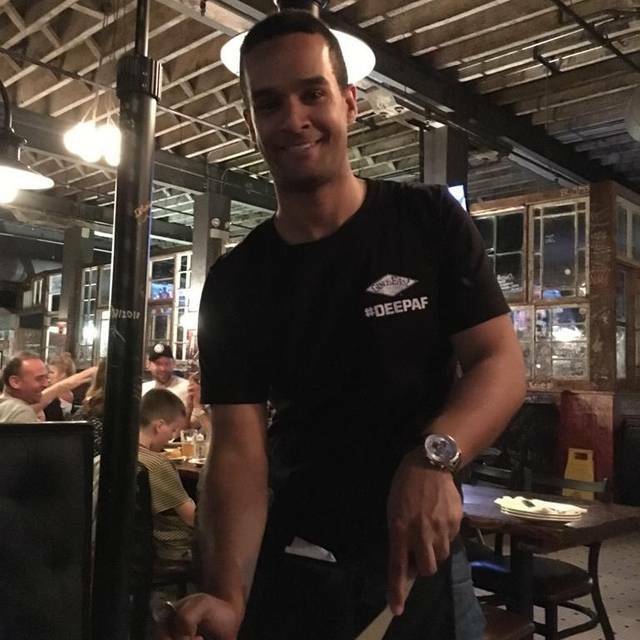 Reservations for 5:45 pm and seated quickly upon arrival, friendly staff and pizza was delicious, will definitely go back! Our server Amber was great. Food was great, the service was great. had drinks in the bar before going upstairs to watch the Comedy Club. I love the old building and its looks...beams bricks really neat. got our Pizza quickly at the table in the Comedy Club. the show.....not so great. Jokes were a little lame, but found a few to laugh at. Comedy Clubs are hit or miss as far as talent goes...but we still had a great time. Overall the pizza provided an authentic Chicago deep dish experience. The staff was very friendly and willing to turn the TVs to the University of Iowa game for us. I would highly recommend this restaurant.